The STI EDGE is the standard for USPSA/IPSC Limited Division since it's introduction in the mid 90's used by winners of World Championships. The Edge has exploded in popularity with SWAT and many Law Enforcement Agencies. 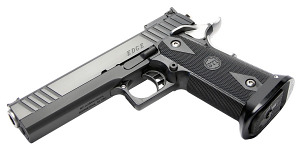 The high capacity option, but still maintaining the standard 1911 grip angle and STI's unique design and capability of not over sizing the grip circumference make this a winner in all circles. Standard features are the high ride grip safety, a ramped bull barrel, adjustable rear and fiber optic front sight, and ambi thumb safety. Chambered in .40S&W.